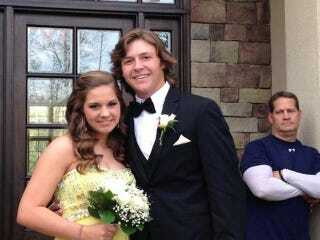 Gene Chizik's got his best disapproving dad pose going on in this prom photo. Hmmm, he's not too sure how he feels about you yet, kid. You better treat his daughter right. Be home by midnight. No funny business. The boy's mother posted the photo online, and though it appears that Chizik isn't too keen on his daughter's date, she said the former Auburn football coach does indeed like him, or at least tolerate him. You can almost hear Chizik grumbling and grunting through the photo.